A couple months ago I spent a lazy Saturday wandering the aisles at Hobby Lobby. I was looking at new accessories that would help my knitting and crocheting. I happened across The Crochet Lite. 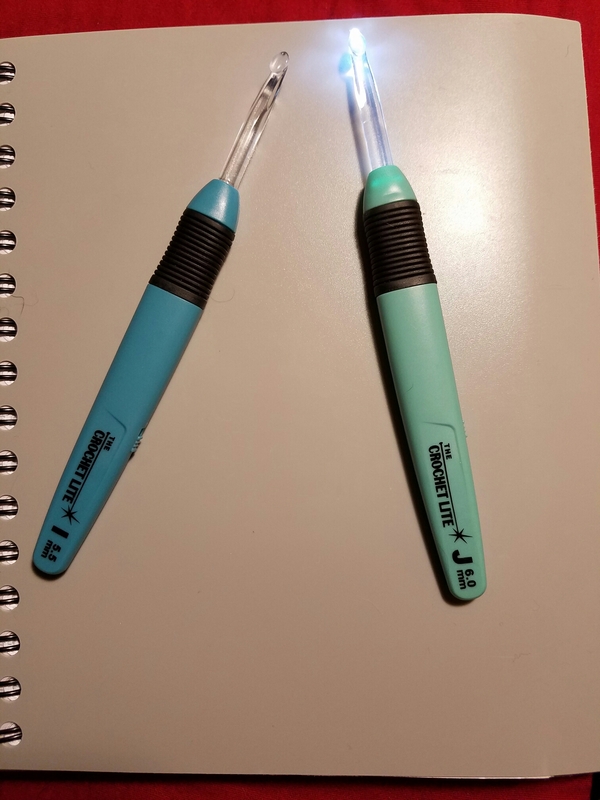 A lighted crochet hook. I didn’t buy one at first because I couldn’t justify spending $6 on one crochet hook. Then I found a justification. 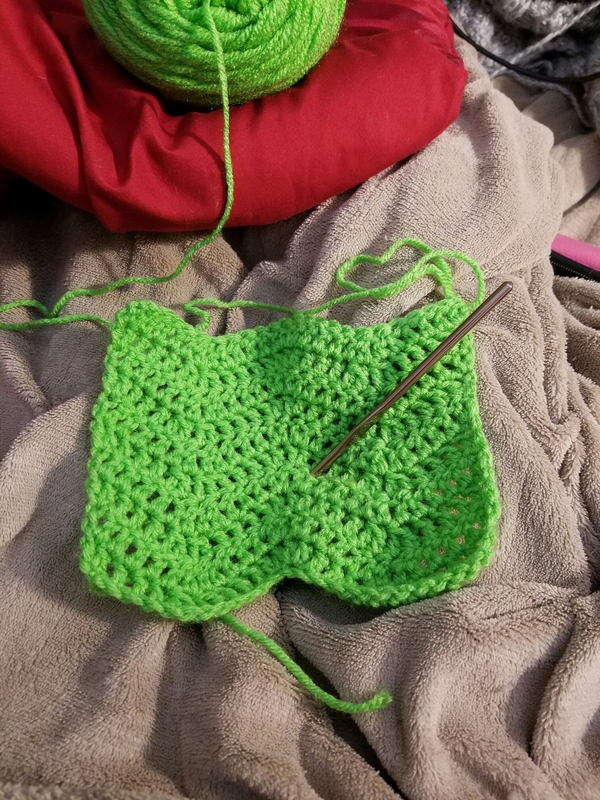 I like to crochet in bed while watching TV or movies. Sometimes I’m too lazy to turn on the overhead light when the sun starts to go down (I like natural light the best). Ta-dah! Lighted crochet hook to the rescue. I now have 2. I eventually want to get the whole set. Right now I only have sizes I-9 (5.5 mm) and J-10 (6 mm). I need size H-8 (5 mm) and I’ll have the hooks I need for all the projects I have going on at this point. So with a new foot of snow and terrible driving conditions they decided that work was cancelled today. North Dakota has been getting some crazy weather patterns lately. Anyways, with my new found freedom for the day I decided to curl up with some hot chocolate and my crocheting. 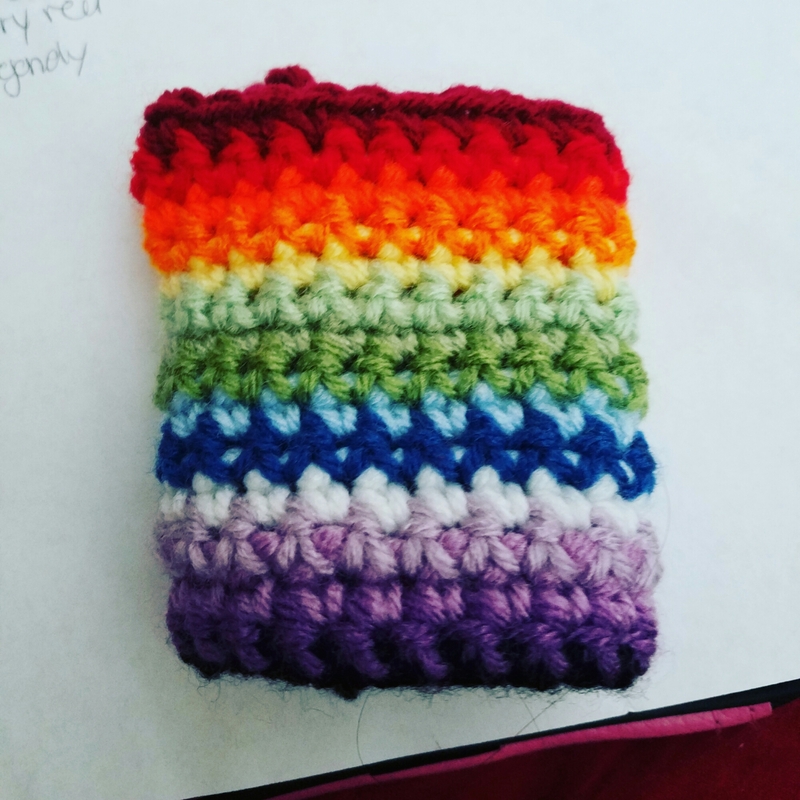 I created a color swatch for my temperature blanket. I think I’m just going to go with a straight sc. for the entire project. It seems to be the smoothest without adding unnecessary length. I love the colors I picked out. I think they’ll blend very nicely together once I get it done. I think I’m going to put some edging on it too… I’ll have a lot of ends to weave in and I think making an edging to it might help blur it a bit. But for now hot chocolate and my basket weave blanket. 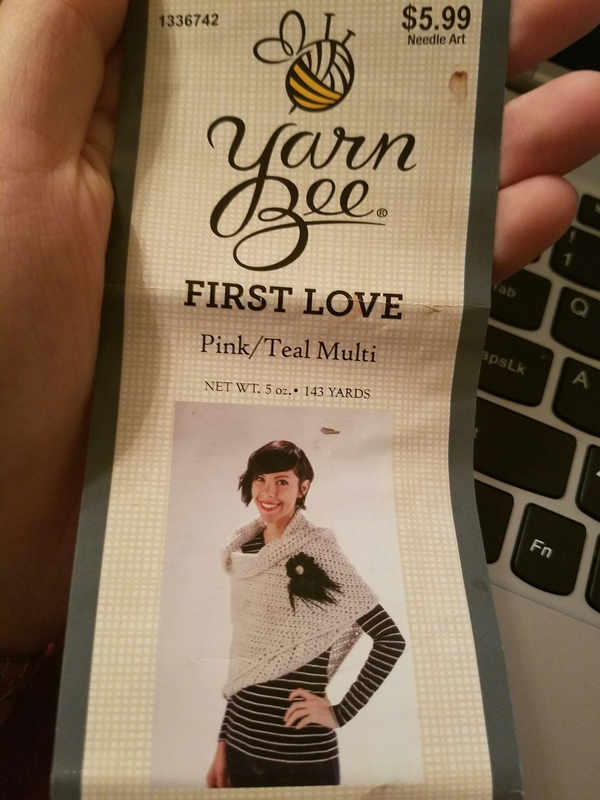 Materials: Yarn Bee, First Love (shown in Snowbaby), 5 oz. skeins of 143 yds. 3 skeins 3 1/2 yds Beaded Trim, Sewing Needle, Yarn Needle. Crochet Hook: Size L-11 (8mm) or size needed to obtain gauge. Row 1 (right side): Ch 4, 2 dc in 4th ch from hook. Next Row: Ch 3, turn, 2 hdc in first dc, hdc in each st across to last dc, (hdc, dc) in last dc. Rep Next Row until shawl measures 79″ across the longest side, ending with a right side row. Do not finish off. Working along sides of rows, leaving 2″ end on Beaded Trim and working around the header of the Trim and sides of rows at the same time, work 2 sc in each row across to Row 1, 4 sc in point of Row 1, working back up the sides of rows and continuing to work around the Beaded Trim Header at the same time, work 2 sc in each row across. Finish off and weave in ends. Cut Beaded Trim 2″ longer than Shawl. Tape off end of extra trim and discard. Remove beads back to the point the Trim needs to end, exposing the Anchor Thread. Thread Sewing Needle with Anchor Thread and secure Trim to the header and to the Shawl. Cut away excess header. First Christmas without my mom. I have some mixed emotions. I’m sad because I don’t get my mom’s fantastic molasses cookies but I’m also happy because I have my puppy cuddled up with me. The animals are getting me through this year. Anyway. I’m working on stitch swatches, getting ready for that temperature blanket. I’m really liking this ripple stitch. It’s so simple and quick. Sorry about the bright color, it’s some of my cheap throw away collection. I’m so excited to get started. I fell in love with this. Instead of using their time in this correctional facility causing more problems and wasting our tax money, they are using their time to better themselves, learn a new hobby and think about why they are there and what they need to do to never go back. I think a lot of places should take this as an example. Art therapy has always been a great way to channel emotions. Why not use crochet and knitting in a similar way. It requires concentration, however, it also is very zen in the way it allows you to think clearly about other things. I just saw this and thought it would be interesting to share. Working on my many projects today. Just one week until I start working on my longest project to date. Starting on January 1st I’ll be making a temperature blanket. 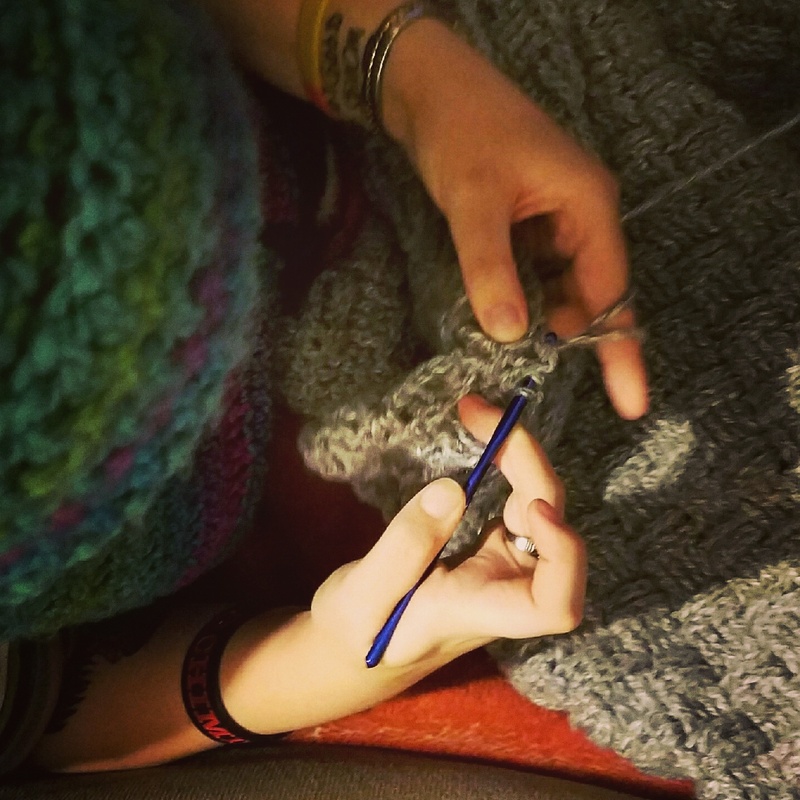 Basically the whole idea of this blanket is that you assign a certain yarn color to correspond with a temperature range. Then you crochet a row a day using the yarn color that corresponds with the temperature of the day. It turns out looking really fun. I chose to make this blanket over the course of a year (January 1st 2017 to December 31st 2017). I’m so excited to start working on it. In the mean time I have a different blanket I’m trying to work on. It’s a queen sized basket weave blanket. I’ve already used easily over 50 skeins of yarn and I’m just over half way done. I have way more to go. Many more trips to this place. 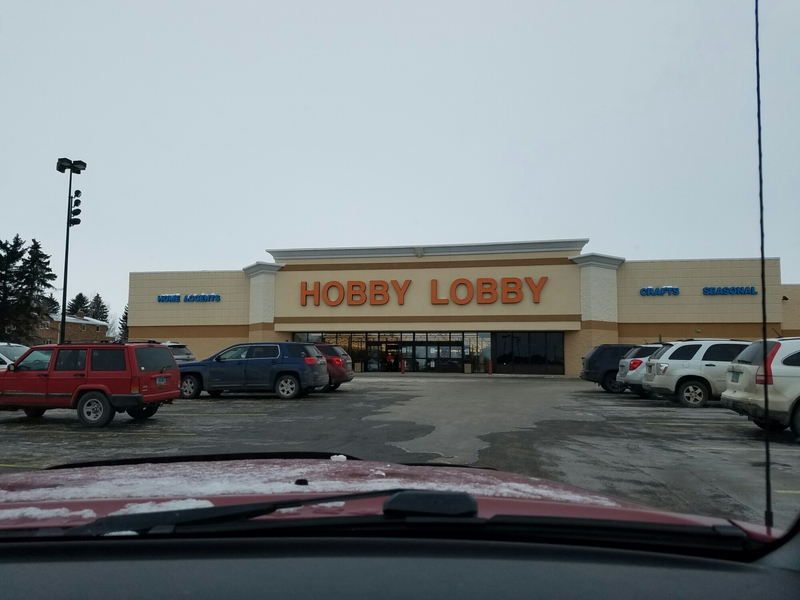 This is the local hobby lobby. I basically live in this store. My favorite place to build my yarn stash. I’ll post pictures of my projects soon. Cloth measures 7″x7″ (18cm x 18cm) square. Gauge: 15 sts= 4″ (10cm); 25 rows= 4″ (10cm) in Garter st (knit every row). Check your gauge. Use any size needles to obtain the gauge. With A. cast on 26 sts. Work in Garter st (knit every row), changing color as in the following sequence: [Work 4 rows with A, 2 rows with B, 2 rows with A, 2 rows with B] 4 times, then work 4 rows with A. Bind off loosely.